One of the first lessons taught to student pilots during their initial flight training is how to perform an emergency landing in a small airplane. At every stage of pilot training, from sports pilot to airline pilot, emergency situations are rehearsed. It can be nerve-wracking for students to remember all of the things they're supposed to when the pressure is on during a real emergency situation, so simulating an emergency for the sake of practicing is necessary. If you can't keep your cool during a training maneuver chances are you'll lose it in a real emergency situation, too. One of the tricks for performing a flawless emergency landing, used by flight instructors everywhere, is as simple as remembering your "ABCs." This memory aid works well because it compiles complicated procedures into a simple format that's easy to remember. I'm not advocating that students disregard checklists. In fact, the "ABC" acronym involves at least one checklist, but it puts the emergency into perspective quite nicely for the pilot, allowing him or her to prioritize with ease and maintain positive control of the situation. The most important thing in an emergency situation, particularly with an engine failure or fire, is to maintain the appropriate airspeed and trim the airplane so that you can release control pressure and focus on the rest of your duties as the pilot. 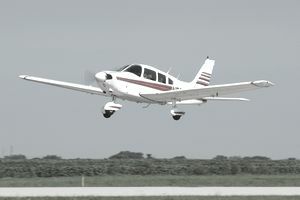 If your engine fails in a small airplane, the first thing you need to do is to maintain the aircraft's best glide speed. The best glide speed can be found in the pilot operating handbook for your airplane. Maintaining this speed ensures that you'll maximize your range so that you have more distance and time to set yourself up for a nice landing and complete the appropriate checklist. Another emergency situation often practiced we prepare for is an engine fire, which requires an extreme pitch-down attitude as an effort to get down to the ground quickly for a landing. The "A" applies to this situation as well, as you'll want to maintain a predetermined airspeed necessary for a quick spiral down to the ground (usually toward the yellow arc on the airspeed indicator, but not faster than the red line speed for practice flights or you could cause structural damage! After you establish the proper glide speed for your airplane, the second most important thing to do is find a place to land. If you're out in the middle of nowhere, it's not usually too hard to find a field to land in. It can be challenging to find a decent place to land if you're over a congested area, though. You'll want to find a place quickly either way, but there are a few things to consider before you rush to a decision. Choose a landing area away from people or buildings. Fields are good options but exercise caution as there are often large ditches, irrigation trenches and power lines surrounding them. Once you find a place to land, try to set up a normal traffic pattern for your approach, remembering to land into the wind when possible. At this point, you'll be happy your instructor made you practice soft-field landings so much! Note: Checklists are examples only—consult your aircraft's operating handbook for actual emergency checklists! The ABC checklist makes it easy for pilots to remember what to do during an in-flight emergency. It's an easy acronym to remember and helps arrange the priorities so that the pilot flying doesn't get overwhelmed. Practicing with the ABCs in mind can make simulated emergency situations and real emergencies less stressful for pilots.